I often wonder if Karma could actually be a valid explanation for what happens to us. I guess it all depends on what you believe. From what I understand of Buddhism, the belief is that you inherit your Karma and bring it unto yourself based on actions in your past lives and that you must live by 'right' actions now to purify for past actions, as well as your present actions, to save you from Karmic 'difficulty' in this, and your next, life. (I am paraphrasing here, of course, as I am by no means a scholar on Buddhism. I am merely sharing what my understanding has come to be, so far). In other belief systems such as Christianity, I don't think they believe in Karma per se, as this is roughly a Hindu and Buddhist belief, but they do have similarities such as the tenet of "you reap what you sow" and the golden rule --"Do unto others as you would have them do unto you". This also is similar to many 'old world' religions as well as beliefs found in the new spiritual movement that teach that what you put out will return to you. I guess I fall into the category of just wanting to always have my actions and reactions in check because I most certainly do believe that the vibrations that you put out return to you in kind exactly what you seem to be asking for. I have definitely come to realize that when I am in a bad mood and act as such, some not-so-fantastic things seem to happen to me. It's as if we really do carry an 'aura' or dark cloud around us inviting trouble. Before I really started paying attention to myself and what I was feeling, I had these experiences all of the time. You can actually read about how I changed this in an article I wrote here. No matter what your religion or beliefs are, I believe this quote rings true in any voice. If you do not use caution in what you say or do, or think, for that matter, and make a habit of acting with an impure mind, trouble will surely follow you. Whether it has anything to do with karma or just the vibe you put out with your attitude doesn't really matter. What matters is that you start to realize that you can change your outcomes-on just about anything in your life. If you are a faithful person, put some of that faith in you. If you are someone who believes in miracles, realize that you are a miracle, too. Start knowing that you are a Divine creation made with perfection and you deserve great things. And everyone around you deserves it, too. I always try to keep that in mind. It helps me to see everyone in a new light; to give them the respect and support that I desire. 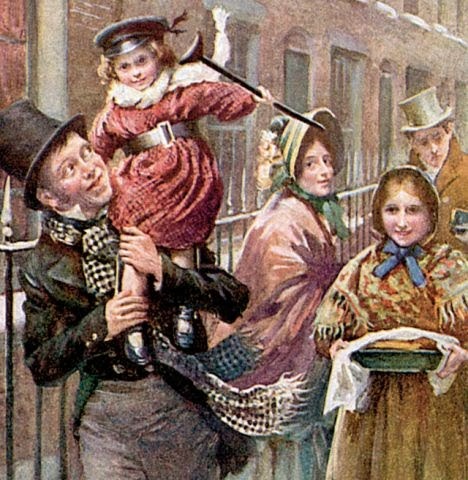 One of my favorite stories of all time is Charles Dickens' "A Christmas Carol". I collect copies of the book, I own copies of the film (my actual favorite with George C. Scott has been almost surpassed the Disney version with Jim Carrey, believe it or not. If you haven't seen it, there's still time...). "...when men and women seem by one consent to open their shut-up hearts freely, and to think of people below them as if they really were fellow-passengers to the grave, and not another race of creatures bound on other journeys." --Scrooge's nephew, Fred, to his uncle's "humbug" of the frivolity of Christmas. The "Golden Rule" moves me as well. We should treat others as we want to be treated. We all have seen how negativity can spread like wild-fire. It would be nice to see kindness burn through this world, now. Have a blessed day and a cozy week-end.